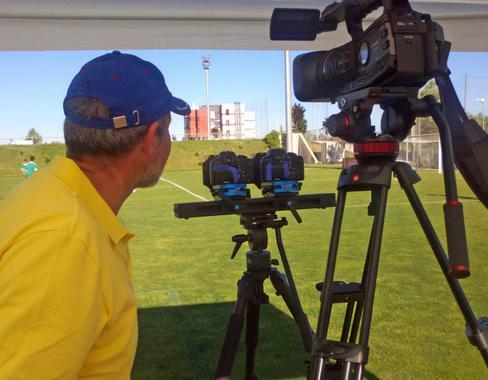 Researchers from the Universidad Carlos III de Madrid (UC3M) are applying stereoscopic 3D to record exercises on offside position for the FIFA to use as teaching material in professional training courses for assistant referees.(OIC/UC3M). The objective of this innovation project is to improve the learning environment of the assistant referees with multimedia materials which offer a visual experience that is the most similar to what referees on the pitch experience, and which can train visual perception in decision-making calls on off-side plays. For that purpose, researchers in the UC3M Television-Film group: memory, representation and industry (TECMERIN) are using this 3D recording technique for the Fédération Internationale de Football Association (FIFA) to use as teaching material in its training courses for assistant referees, within the framework of referee professional training and development all over the world. Over the course of two days, the TECMERIN research group recorded 500 simulations of off-side plays in stereoscopic 3D with different types of exercises, similar to those used in professional training courses for International FIFA referees. “Among these, those most appropriate to create interactive material to be used by assistant referees all over the world will be chosen,” UC3M professor Manuel Armenteros, coordinator of the project, explained. “The use of stereoscopic images will significantly improve the learning experience due to the fact that a 3D stereoscopic image learning environment generates a visual experience that is much more realistic than 2D,” he asserted. The technique of creating stereoscopic images uses two lenses, one for each eye, which obtain a greater sense of depth than 2D images. The visual perceptive systems use the differences between the images of each eye to calculate depth. In spite of the fact that stereoscopic 3D technology has been used for years, this technology could not have attained its current widespread use if it had not been for digital treatment of images. The stereoscopic 3D revolution is linked to the digital revolution, the researchers note. The overlapping of the two images necessary for the creation of stereoscopic images issimplified with the use of a computer, which eliminates the imperfections of previous techniques. The spread of stereoscopic 3D into the domestic area, including recording as well as visualization devices, portends a visual environment which represents a significant advance in the creation of images, as important as that of color, according to Professor Armenteros. Stereoscopic 3D will also influence in narrative aspects, so that a thorough reflection upon its use becomes of essence in the professional as well as the academic environment, explained UC3M professor, Anto J. Benítez, another of the researchers participating in this research project.